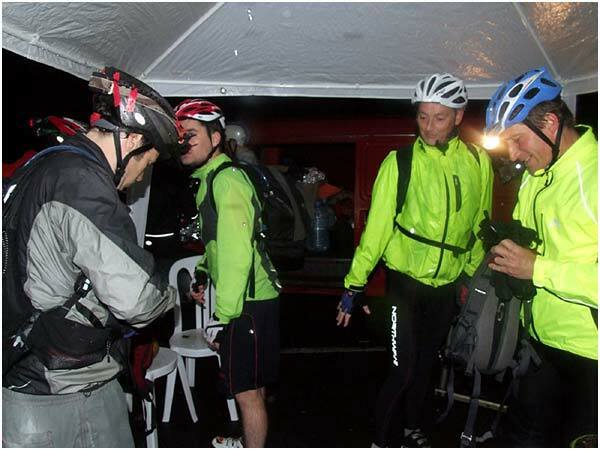 Just after most of the riders had gone through the light came on on the bridge, very pwetty! 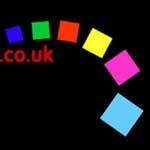 We set off, and soon caught a group who�d has a puncture. Just after the right truen at the lights on the Clevedon Road the was a huge bang, and every flew off the bike, and my handlebars swung right down. I�d failed to spot a large drain cover with broken repairs around the edge and gone straight down it. I thought it was the end of the front wheel, but apart from a punctured front tyre, and various bits that had flown off the bike, and two aching wrists, all seemed OK. I fixed the tyre, reset the bars which needed an Allen key so it must have been a fair impact, probably the bars dropping saved me going over the top. We were off again into the lanes and the rain was with us, although fairly light and we had a tail wind. Turned too early at Yatton ( AGAIN ) and had to track down a bit of the A370 to pick up the road through. The climb up Burrington wasn�t bad, a bit damp as was the descent of Cheddar Gorge. The Lobster Cafe was on the right near the bottom complete with gazebo� did I have any brake blocks left? 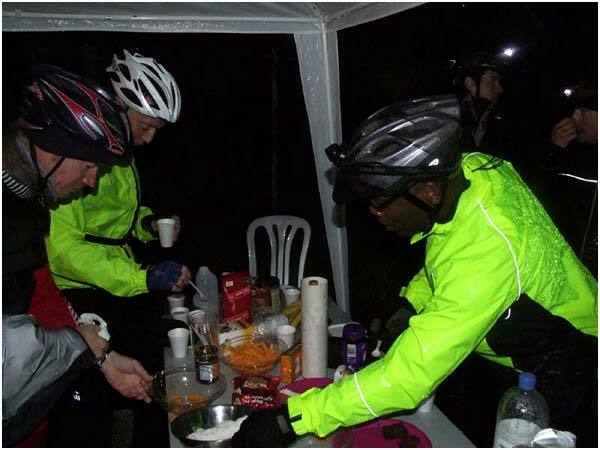 Chuffy and Baggy were doing stirling work dishing out the teas and coffees, and helping to try and warm one or two riders who had chilled. It was warmer than last year despite the rain � soon the Dawlish Boys arrived having been on a later train, and then Brian Jago turned up grinning from cheek to cheek. We pressed on through Wedmore with the rain getting heavier, and now quite irritating. 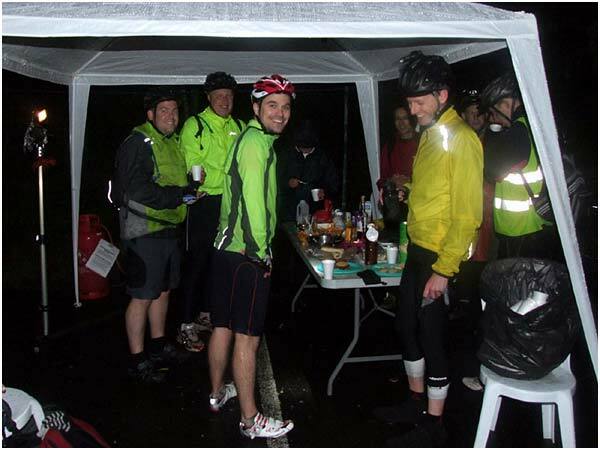 I stopped to check the route sheet and the Dawlish lads caught us up and then turned right towards Burnham � we shouted but they were gone into the night! Navigation to North Curry was better than Geoff and I managed last year with his CPS! This time we got the right turn and arrived there at about 3am where Helen almost instantly produced a plate of pasta and sauce. The Dawlish boys arrived again having done the Tour of Burnham and Wrantage. A few more photos were taken through a sopping wet lens � I considered putting on arm warmers but they were sopping wet aswell, so we set off again and noticed that the rain had stopped. We only travelled a few hundred yards and it started again. There was a hint of light in the east indicating that Dawn wasn�t far off, and as we headed down past Burrow Mump, we had broken glimpses of a full moon setting behind dark grey clouds. Before long we hit the climb at Blagdon, and by now it was light, the rain had cleared, roads were drying out and the views were superb. At the top of the climb I broke out the Jelly Babies, Stewart was there from Exeter with his friend, and me Matt, and Brian. The five of us rode on past Smetharpe accompanied by the dawn chorus, and then we spotted the lamp indicating that the mobile Lobster Cafe was open for a morning cuppa. The temperature was dropping a bit, and mists rolled around as we tucked into a few rations ready for that last 25 miles to Exmouth. Matt hurtled down in Broadhembury, I followed, Brian was much more cautious as his front brakes were on the way out. Soon the sun broke and it was a fantastic finish through the lanes around Feniton and Tipton St. John. I could almost smell the sea at Otterton when a dull rumble indicated that my back tyre was flat. A piece of white quartz had hammered through the case, - time for another tube change, - the wheel was a right mess with 50 miles worth of Somerset crud on the rim. Sorted � and we were on our way up the hill to Yettington � this seemed quite hard this year, - hardly noticed it last year! We said cheerio to Matt in Exmouth as he had family to meet so Brian and I rattled down the Sea Front to the Harbour View caf� , and indulged in the Cyclists Special Breakfast! Brian went off home on the train, I had a tailwind ride home to Newton Abbot, with very tired legs going over Haldon with 136 on the clock including going up to Clifton. Well done to everyone who got to the finish � it was a memorable run made more so by the weather, and huge thanks to Dave, Chuffy, Baggy, Helen and all who helped to make the event ��. EE5�..bring it on!